After asking everyone's opinion on what to do with this skirt, I went against the majority and had it shortened. And without regret, I'm loving it. Your shoes are too cute! The color makes me think of Tiffany. Nice choice deciding to shorten the skirt! I like it short. It works better with your TINY frame. 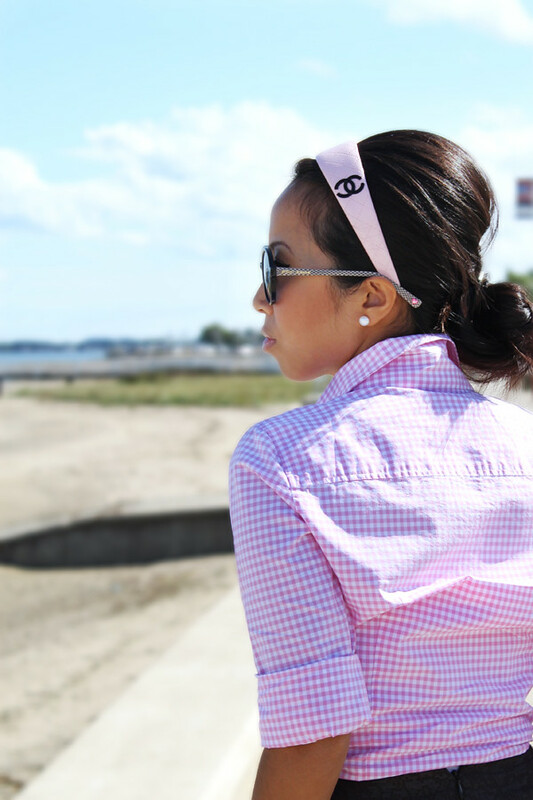 I like that pink jcrew gingham shirt! :D I have it in brown, but I really like the pink! That's a cute skirt! You definitely made the right decision! Ooh! 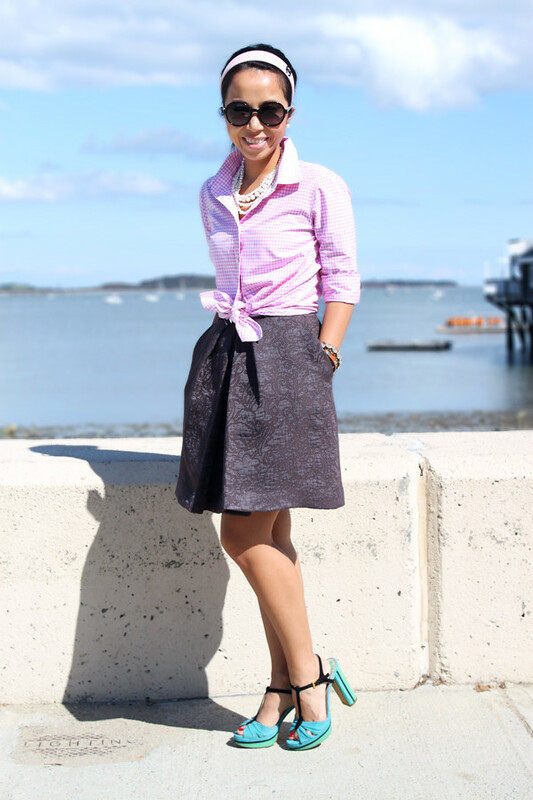 I really like this outfit!- an update of poodle skirts days except chic'er. I like the skirt; the design makes it really unique. i think the shorter length on the skirt works out much better for you. and the headband is the perfect addition! Love the fit of the skirt! Done so beautifully! I am really loving that headband. Let me know when you get tired of it. LOL! Those shoes are so great! I like how you styled the gingham shirt into this otherwise quite feminine and girly look (pearls, Chanel headband). Gives it a bit of a twist, which you always excel at! You look adorable! I love that skirt and those shoes are absolutely killer. oh I love how you paired the pink and the aqua! Loving your skirt and shoes! The skirt is beautiful and oh those shoes...what a shame to put them away for winter. They are fab! Those shoes are gorgeous!! And the outfit is adorable - I love how you mixed the gingham with the lacey skirt. You are so freaking adorable. This outfit is super "Betty Draper" too - and it doesn't get any better than that! Headband looks adorable my dear! Good going on shortening your legs - really elongates your figure. And of course who can say no to prada shoes ;) Thanks for the outfit inspiration! I meant shortening your skirt. I re-read my comment and LOL'd. HAHAHA. I absolutely love those shoes! So unique! Those shoes are seriously amazing!!! Your whole look is too cute.